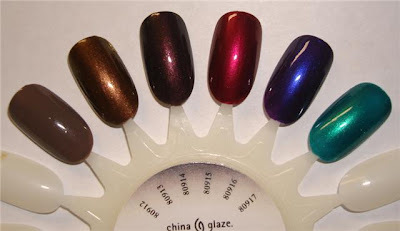 Above & Below: My hopes have been dashed by the cancellation of China Glaze's Dark Secrets release, above. But Essie's Sweet Time of the Year, especially Mint Candy Apple, will help fill the gap during this lull of new collection releases. I was anticipating the upcoming Dark Secrets Winter Collection release from China Glaze, but unfortunately, it has been postponed. I don't know if it's going to be released at another time or if it has been cancelled altogether, but I do know that I'm disappointed. I thought it was a dark, delicious offering of shades for Winter, but now we may never know. Perhaps all of the hype and success of the Glitter collection pushed it aside, but I wanted those shades! Especially the teal one. Hopefully, they'll change their mind and we'll be able to see them someday. In the meantime, we don't have too much to look forward to over the next couple of months as far as new offerings. 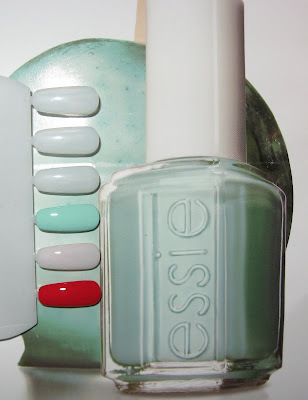 In the meantime, I'll keep gazing at the "Sweet Time of the Year" promo pictures from Essie, due out later this month. Mint Candy Apple will keep my spirits up! Congratulations to Deanna, the winner of the Tarte Cosmetics giveaway. I don't think she has a blog I can share with you, as I haven't heard back from her as yet. A special thanks to Tarte Cosmetics for furnishing the prize collection. Total bummer! I was wondering how they were going to do this after the 6 khromes and the 50 glitters... but yeah, bummer. Thats horrible! I was looking forward to this China Glaze collection the most! I hope they just push it back a little. I am quite excited for the Essie collection though! Well that stinks! I was looking forward to Dark Secrets too...oh well. I have to agree, Mint Candy Apple does look exciting! Thanks for the heads up. OH :( I was looking toward that collection so much. I love China Glaze. Aww, man, I wanted 80196, next to the teal. I cant tell it if its purple or blue. I hope they release it though! krisprimps~I know, it was such a pretty collection. Fingers crossed that they change their mind. Rachel~I do think that may have had something to do with it, but who knows. Velvet~Thank goodness Essie has something coming out...there's not much else going on right now. Not that we *need* anything else! AllYouDesire~I love China Glaze too, and maybe we'll see that collection some day. The Pretty Brown Girl~My fingers are crossed right along with you! Adorepink~I'm not exactly sure what some of those shades are either, but I wanted them!